GIGABYTE 400-series maximize your PC's potential with AMD StoreMI technology. StoreMI accelerates traditional storage devices to reduce boot times and enhance the overall user experience. This easy-to-use utility combines the speed of SSDs with the high capacity of HDDs into a single drive, enhances the read / write speeds of the device to match that of SSDs, bolsters data performance for incredible value, and transforms the everyday PC to a performance driven system. AORUS 400-series motherboards use Hybrid Digital PWM + Lower RDS(on) MOSFETs to offer incredible precision in developing power of the motherboard's most power-hungry and energy-sensitive components as well as delivering enhanced system performance and ultimate hardware scalability. RGB Fusion offers users the option to control onboard RGB and external RGBW / Digital LED light strips for their PC. Already feature filled with colors and patterns, RGB Fusion on AORUS motherboards are upgraded with Digital LED support. With external digital LED strips, where each LED is digitally addressable, users can experience even more patterns, styles, and illuminations. AORUS gaming motherboards will support either 5 V or 12 V digital LED lighting strips and up to 300 LED lights. Delivers high-quality sound resolution and sound expansion to create the most realistic sound effects for professional gamers. 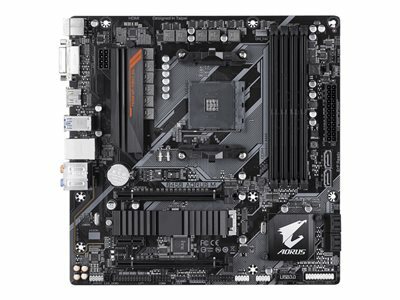 AORUS 400-series motherboards feature solid plated ATX 24-pin & ATX 12V 8-pin power connectors for offering stable power supply while CPU overloading. 4K resolution is a technological milestone in high-definition content delivery, utilizing approximately 4,000 pixels on the horizontal axis, more than four times today's standard HD pixel density. GIGABYTE motherboards provide native 4K support with integrated Intel HD Graphics via HDMI. HDMI is a high-definition multimedia interface which provides up to 5 Gb/s video transmitting bandwidth and 8-channel high-quality audio all through a single cable. Able to transmit superior, uncompressed digital video and audio, HDMI ensures the crispest rendering of digital content up to 1080 p without the quality losses associated with analog interfaces and their digital-to-analog conversion. In addition, HDMI is compatible with HDCP (High-bandwidth Digital Content Protection), allowing the playback of Blu-ray / HD DVD and other protected media content.